The following dates may be clicked on to view a panorama of the site at that date. From April 2009 the Stadium 'appears' almost complete. The viewpoint (up to June 2009) was the only one available for public viewing. It was situated directly over Marshgate Lane. The second series of panoramas (from March 2010) were taken from the official viewpoint in the observation tower. From July 2014 the original viewpoint became available again. Conversion into a football stadium was taking place. The first series of panoramas has been resumed and will be updated periodically. Each dated page shows two panoramic images. YOU MAY NEED TO SCROLL RIGHT TO SEE ALL OF THE IMAGE! Three Mills Lock Electric Fence around site. 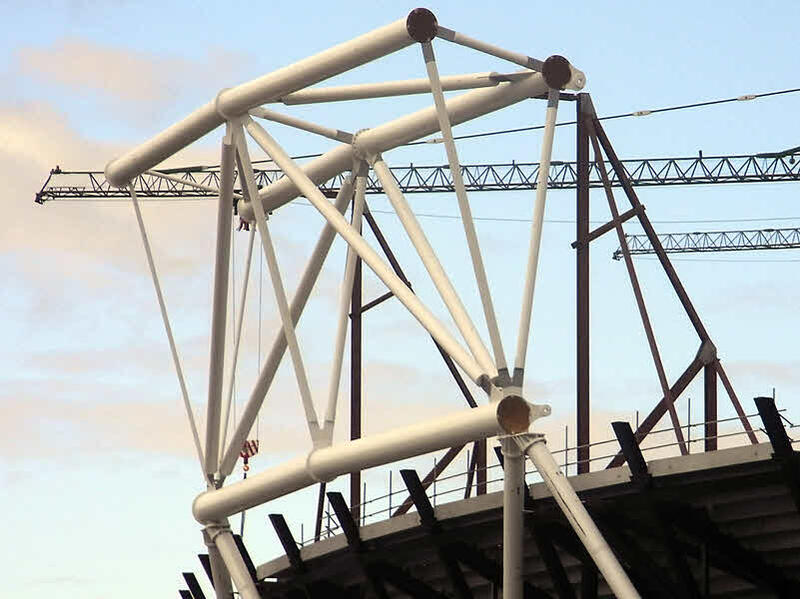 Cladding of Stadium Starts 'Orbit' tower under construction. The above view of the site was obscured by security fencing from July 2009 to July 2014. A panoramic view of the site taken from the View Tube whilst the usual view was obscured.